Jiophone launch in 21 July 2017 and it is announced by Reliance Jio Chief Mukesh Ambani at the company’s Annual General Meeting. The JioPhone runs on KaiOS which is a forked version of Mozilla, the KaiOS version application is not available at this time. But, Reliance Jio launches an application for app store name JioStore which is pre-loaded with all JioPhone. 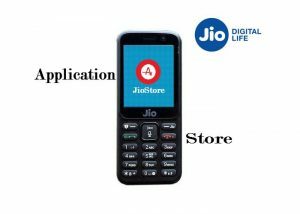 JioStore is a KaiOS base application and it is only for Reliance JioPhone or JioPhone 2. JioStore like as android application store Google PlayStore you’re probably used to. JioStore have various of app categories like entertainment, utilities, social, news, books and sports, it offers a variety of apps for all uses of games and much more. Now popular applications are available through JioStore like JioChat, JioVideoCall, JioTV, JioMusic, JioCinema, Hotstar, Whatsapp, Youtube and Facebook Apps are free of cost. 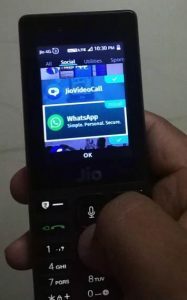 They can be downloaded directly on a KaiOS device through the JioStore mobile app or by deploying the application to a device from the Reliance Jio website. JioTV, JioCinema, Hotstar, Youtube and Facebook also serves as a digital media store offering music, magazines, books, movies, and television programs. Reliance jio cannot provide game application from JioStore, they said KaiOS version game application is not available now, it is processing to work when it is finished then we published on JioStore. Then you can download or Install Games in your JioPhone and play. At First you need connect Internet connection in your JioPhone. Then you have to open JioStore in your JioPhone. When you open the JioStore in your JioPhone, then you will see popular applications list. After choose an application, which you want. Select application then click on the Install Button. After the app download is completed, you will see that the app is installing in your JioPhone. When the installation is done, you can run the app in your JioPhone. Finally enjoy the application experience with your JioPhone.